Security guards of Greenland Estate in the Mende, Maryland area of Lagos State yesterday killed three 30-foot pythons, leading to wide spread of fear and panic in the area. PUNCH Metro reports that the killing of the reptiles brought panic into the estate as residents expressed fear for their safety. It was gathered that the animals were exposed after the dredging activities of the Lagos State Government. After killing the pythons, the security guards on the estate put them up for sale for N10,000. The Vice Chairman of the estate, Sola Adekoya, said more than 15 pythons had been killed on the estate in 2016 alone, urging the government to find a lasting solution to the overgrown canals in the area. “The security men and some squatters caught the three pythons this morning around 8am. The giant snakes were about 30-foot long. It was learnt that residents of the area always stayed indoors at night for fear of being attacked by snakes. 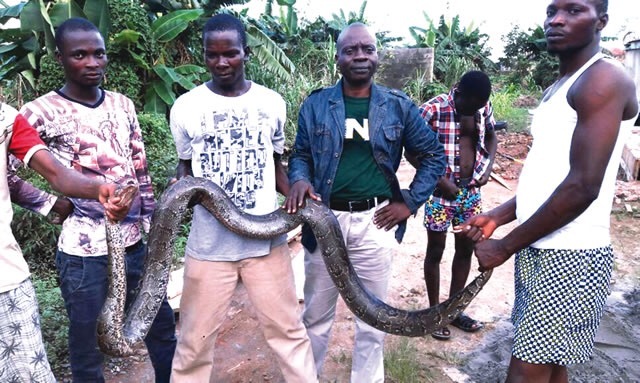 A visitor to the area, Adewale Adeoye who saw the three snakes when they were alive urged the Lagos State Government to create a zoological garden for the animals to preserve them and generate income for the state. “These snakes are worth a fortune abroad. The Lagos State Government should conduct a wildlife survey in order to preserve threatened animals and plants.